Felt surface requires ongoing cleaning care to ensure the best performance. If there is some dirty or small things on the felt surface, please take an air blower to blow it away. Never clean it with brushers. American oak wood frame provides a rigid board construction. The letter board is firm, moisture-proof and anti-deformation and can be last long. The letter board can be steadily supported by the adjustable wood stand or just hung on with the metal wall hook. Just to show Love, Inspiration, milestones, passion, reminders, Chore List, etc. with the 730 letters, numbers and emojis. Letters, numbers or emojis that you don't use most often can be stored in the bag for safe keeping, and you can also protect against losing those precious letters that are just waiting to be used. A scissors is included to make it easy to separate your letters. Special designed packaging prevents shipping damage to the letter board. We offer life-time warranty, an order with totally NO RISK for you. Just Add to cart! WARNING CHOKING HAZARD, small parts Please keep out of the reach of small children! 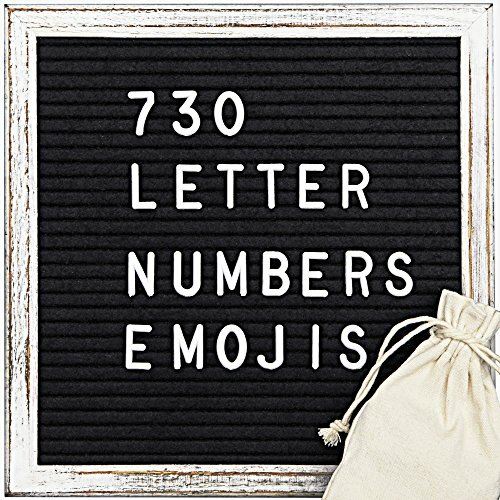 COMES WITH ALL ACCESSORIES: 730 letters, numbers and emojis for your choice, you can express whatever you want on this DIY letter board. The letters are supposed to be cut by the equipped scissor. And all the letters can be stored in the equipped canvas bag to optimize your space. You can adjust the viewing angle of the wood stand according to your own needs or just hang the letter board on any place through the back hook. PREMIUM QUALITY & EASY TO USE: The solid wood frame is made of American Oak wood，passed the American fumigation certification and SGS certification. It is quite stable and durable. The board surface is equipped with high quality felt. Letters can be inserted into the felt easily, never worried about letters dropping down. The felt is not rough and epilate, making the letter board to be a long-lasting product. BEST CHOICE FOR GIFT: Put your sincere love in your heart in the letter board that is the most meaningful gift to friends and families. Life is much more beautiful because of love. The letter board is also an ideal gift for children or kids for to inspire their genius. You will be definitely surprised by their creativity and imagination. 100% SATIFACTION GURANTTEE: If you for any reason are not 100% satisfied with our letter board, please contact us right away. Our hassle-free customer service team will work hard to resolve any issues that you have with this message board. If you have any questions about this product by maxtek, contact us by completing and submitting the form below. If you are looking for a specif part number, please include it with your message.